You're Sew Crafty: Homemade Prefolds! So I posted this on my old blog but I am reposting (and adding a few things) on here so that all my craft projects are on here. Making prefolds is just too easy! So first you will want to decide a few things. What material are you using? You can honestly use anything but I like using hemp because it is the most absorbent without needing so many layers! And now you want to decide, How many layers thick do I want my prefold? After you know that you will have to do some math. Who ever said you wouldn't use the math from back in Elementary school was lying! I like my prefolds to be about 12-15 inches wide - so I will have three 4-5inch panels... does that make sense? So you take the amount of layers you want times the number of inches each panel will be (for example If I want a 2-3-2 prefold meaning the two outer panels are 2 layers and the inner one is 3 layers then I will add 2+3+2=7(layers) x 4 (inches per panel) = 28inches needed.) OK, did you figure out the math yet? After you have worked that out you will need to decide how long you want your prefolds to be. I like mine to fit in a cover without needing to fold them down at all so I like about 15in or so. Recently I bought 5 yards of hemp french terry and using the math I just explained I worked out this plan for cutting to maximize the usage of my fabric! The fabric I have is 60in by 5 yards, I am able to cut this in half so that I have two 30in by 5 yard pieces. 1 yard is 36in 5 yards is 180in/ 15 in (thats how long I want my prefolds to be) = 12 I can make 24 prefolds with this fabric. Obviously if you want your prefolds thicker your work up may be different from mine... this is just how I like mine. As a trick though if you still want to use this work up you can still cut like this and then make it a 3-4-3 by adding a 12-15in piece of fabric in after everything is all ironed. Or you could just add a couple 4-5in pieces to the middle panel if you wanted a 2-4-2. You can really customize it however you like. So to fold a prefold you start by folding about 8-10 inches (depending on how wide you are making each panel) over. If you want that center panel thicker and you have allowed for that in your math earlier (meaning you have 35in wide pieces and not 30in wide pieces like me) you can fold over 4-5 inches first and then fold over the 8-10 inches. After each fold you want to iron a nice hard crease. Now you are going to fold the other side over 8-10 inches. You will be overlapping the middle part by 4-5inches. Iron all your folds. You will now have a rectangle or square that has 3 panels. Two that are 2 layers thick and one (in the middle) that is 3 layers thick. One side will be flat and look like all one piece. The other side will have a middle that has been folded over and will look like 2 pieces. Do you want your prefold a little thicker? Then add a square or rectangle that is the same size as the prefold when it is all folded up into the middle of the folded up prefold. No one will know that you didn't do all that extra folding! 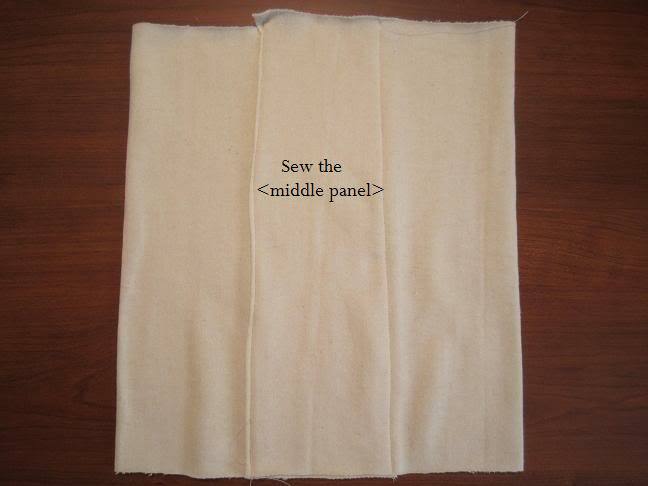 Now you are going to sew the middle panel in place. Very simple just a a straight line on both sides of the middle panel. You can tuck under that one unfinished edge of the middle panel so it looks nice but if you are using a knit material this is not necessary. 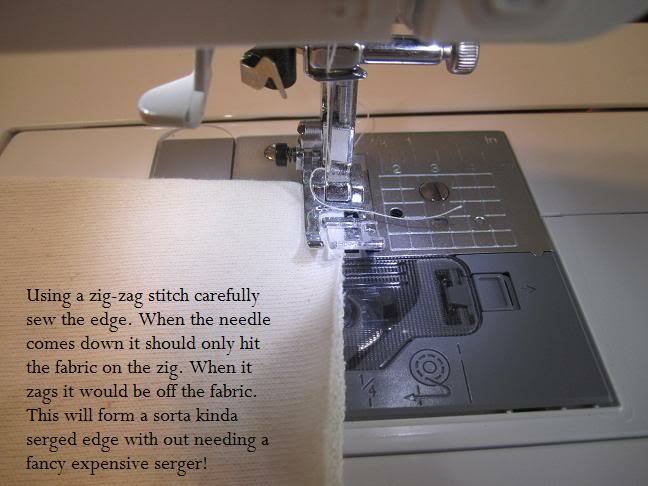 To finish up the edges of your prefold you are going to do a zig-zag stitch just like you did with the bra pads. Set the machine to its waviest setting and when you sew the needle will hit the fabric on one side and no fabric on the other side. This will close up that seam nice and tight. 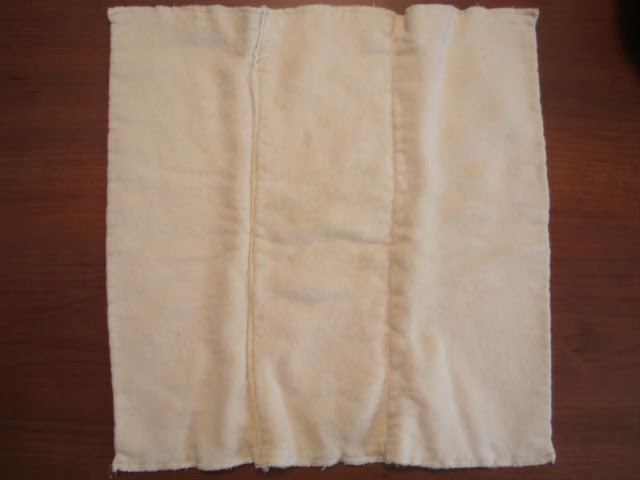 If you want a layer of "stay dry" feeling for your baby (if you are using these trifolded like I do) then you can simply sew a piece of fleece the same size as the middle panel onto the middle panel. And here is the finished product. My edges are a little wavy because this material I am working with is SO stretchy and I just cant get the tension perfect. So again, if you want to - for a stay dry feeling or a nice cute look you can add some fleece to the middle. You can even leave the ends open so that you can stuff doublers in there like a pocket prefold! So what do you think? Still think cloth diapering is too expensive of an investment? It cost me $40 for these 5 yards of fabric and I made 24 diapers... Thats less that $2 per diaper! I would love to see what you did! Did you add the fleece? Or maybe some decorative ribbon? Prefolds are so versatile! You can use them as diapers or you can use them as burp cloths or dusting towels... What else have you used a prefold for? Hannah, honestly, I'd just make them the size she suggests and fold down the back a little bit. That will make them last longer, and you'll save more money. (This is secretly why I use flats--they're the only true one-size diapers out there.) Plus, the little fold acts as a poop catcher.